Recent discoveries on the mycelium mat of fungus that grows in soil have uncovered a robustness and adaptability nobody would have guessed. Several companies are starting to capitalise on the uses on this new plastic-like material. Even NOAA, the National Oceanic and Atmospheric Administration is using this material in its scientific buoys. Given the cost and shortage of oil, such discoveries that cost virtually nothing will help the environment in the best ways possible. Rather like bacterial variety, fungal clones to suit certain products are relatively easy to engineer. Fast growth, often within five days, is a prerequisite and the effects of heat treatment determine how useful each species and its variants are. The raw materials for the species used at the moment are farm waste, and other plant materials like seed hulls from rice, buckwheat and oats and cotton gin waste. There is of course no need for light with a saprophyte, while room temperature, or a self-creating composting temperature, is ideal for growth What happens is that millions of microscopic fungal fibres fill every cubic centimetre of the waste(that's 8 miles of fungal hyphae per cubic inch! ), following a necessary sterilisation and chilling of the raw material. What is the product? Mainly a shape of packing product at the moment, shaped from the beginning to fit a wine bottle for shipping or as a candle-holder. When no longer needed, the fungus is simply home-composted, or obviously is acceptable in local recycling plants. 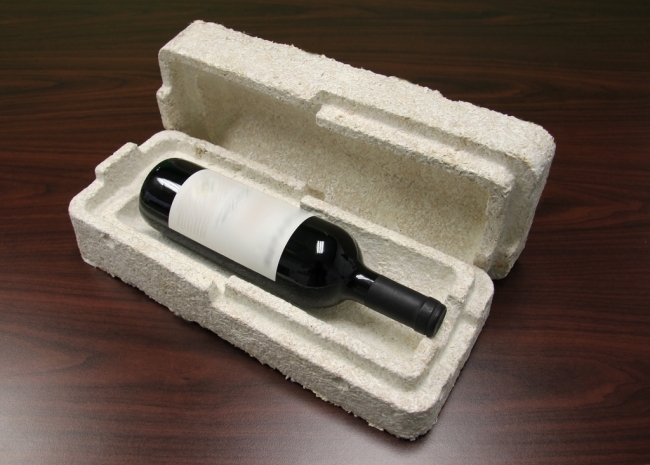 The disposable and biodegradable element of the fungus makes the products ideal for packing, but there's no reason why mycelium shouldn't be as valuable as wood, paper, stone, cotton or wool. With such properties as acoustical sound attenuation, easily surviving accelerated-aging tests and fire retardation, car and truck uses have proliferated. Some cars could soon be 90% biodegradable, which improves on those old rusted specimens we used to see! The recent discovery of fungi in the Amazon  the river, not the online store!  means we will see polyurethane being eaten by the organism while the plastic is also replaced by another mycelium. Another species of mushroom could light its own containers, if we could incorporate the luminescent properties of some species. What a come-down for the once-ubiquitous, but poisonous, plastic.